You are here: Home » Uncategorized » People in glass houses should not throw stones, as KM gets it wrong, again! People in glass houses should not throw stones, as KM gets it wrong, again! How the High street looks this month! no bunting up yet? and allied sound and light gone? 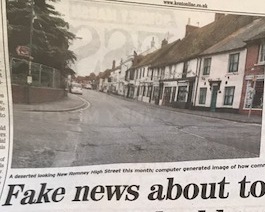 In today’s Kent Messenger newspaper, on page 2 there is a report about social media spreading fake news, but the picture shows, what is reported to be “A deserted looking High street taken THIS MONTH” when in fact the picture they are featuring shows premises which haave been closed for over five years! The KM has recently has attracted criticism from The Looker for lifting locally sourced news stories from their website and Facebook pages and reporting them as their own. 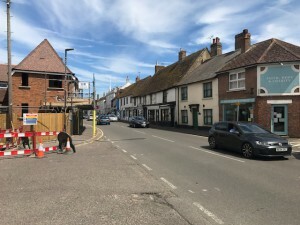 The most recent related to a story that was exculsive to the Looker relating to New Romney town council which appeared almost word for word what was written in the Looker report, plus another taken from our Facebook page .